2009 has seen so many changes in the Search Engine Industry and you would probably be surprised to realise how these changes have an impact on your business. The Vince update is already so far away and so 2009 anyway, but 2010 looks very promising and full of exciting innovations that will keep on influencing the way people search, and find. The Search Engines have come up with so many new ways to personalise your search results, logged-in or not, based on your search history, on your social media profiles, your location, etc. 2010 will see more of these customised results and the challenge will be to maintain relevancy for all users while businesses will have to maintain their search engine rankings in the new top 8+2. For the online marketers, it will become a greater challenge as they will have to manage the balance between more online profiles to maximise their search engine visibility while ensuring that their primary property ranks ahead of the others. Since Matt Cutts revealed during an interview with Web Pro News that Speed will become part of the Search Engines ranking algorithm in 2010. To rank higher, the webmaster will have to optimise code, technology as well as content delivery strategies to win the race. Bing opened the ball this year by starting to index tweets, and Google followed and started displaying real-time search results with its “Latest Search Results” option. The online marketers and the public relations people probably had a chill down their spine realising how much more crucial reputation management then became. b) they want to host their own videos to attract more traffic to their site as opposed to having better chances in ranking for their keywords via video sharing sites. 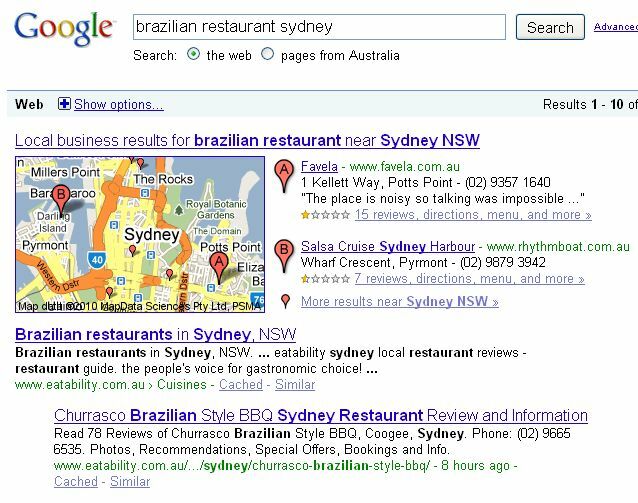 The release of Google Maps in 2005 has changed the way people search locally. Little by little, Google Maps has delivered more local results, establishing partnership with local directories and mapping companies to improve the quality of their results. It can now be used in so many aspects, from getting directions to a place to getting a closer look with Street View. The introduction of the new dashboard in the Google Local Business Centre earlier this year has once more proven that it has now become essential to be listed on Google Maps. Bing has recently launched their own Maps engine “Bing Maps”, which has an emphasis on user experience. These new Maps engine now provide a new arena where the SMEs in particular can easily be found and rank for their search term + location. These businesses can now also be found by users searching for keywords only, using the geo-targeting features of the new smartphone generation with built-in GPS, and therefore potentially converting a sale in minutes if the business is found by a mobile searcher. These new local business listings also provide an opportunity for businesses to rank for highly competitive terms, even without a website. If you want to learn more about SEO, Bruce Clay Australia is organising a 1 Day SEO Training presented by Jeremy Bolt in Sydney on February 17th, Brisbane on April 7th, Melbourne on May 12th, and Sydney on June 9th as well as a 3 Days presented by Bruce Clay in Sydney on March 10th, 11th and 12th. I absolutely love reading your articles, the manner of writing is amazing.This article as usual was educational, I have had to bookmark your site and subscribe to your feed in ifeed. Your site looks great. The SEO checklist given by you here is well informed and useful. This list describes the main aspects of search results. These are the few things we can’t ignore to have a niche in this tough competitive world. The load time of a website may affect its ranking in the search engines. That is, the faster a website loads, the better its chances to rank well for its niche keywords. And it has been proven that the number of visitors to a website increase exponentially when listed in local search results. I have visited your links they seem very interesting and informative for link exchange. We will bookmark your site for further visiting. Thanks!